When she’s not doing nails, she loves spending time with her boys, her husband, and riding her Harley. For this month’s cover, Baker-Bennett created these beautiful watercolor flowers out of EZ Flow acrylic. The ethereal effect is stunning and definitely worth recreating. 1. 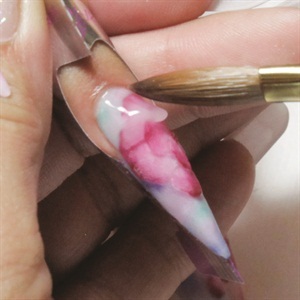 Using Ez Flow Truly White powder, sculpt the base shape. Cover the entire nail, keeping the product very thin. This creates the “canvas” you will be working on. 2. 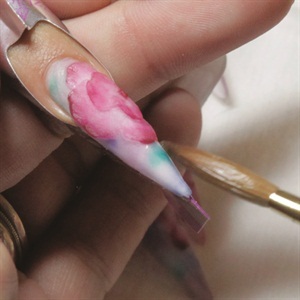 With Aspiring Hues from the Ez Flow Watercolors collection, start to create your flower using small beads of acrylic and pressing them out into a petal shape. 3. 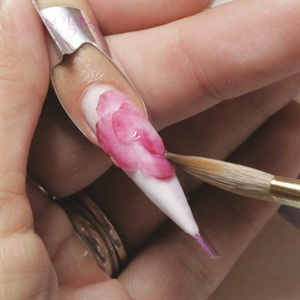 Add more petals over the first layer to create dimension and finish your flower. Try to keep everything as thin as possible. 4. Shade and add detail to the flower with Mind’s Eye, also from the Ez Flow Watercolor collection. 5. Use Aquarelle, Painter’s Palette, and Brushstrokes in small wet beads to fill in empty space around your design. Fade each color into the other by slightly overlapping them. 6. 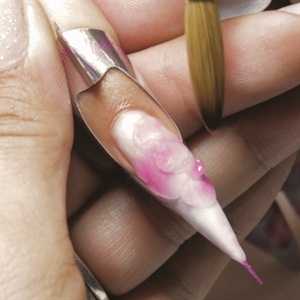 Cap the entire nail in Ez Flow clear powder, building in the structure of the nail. 7. File and shape the nail. File carefully so you don’t file into your design. Buff to a high shine. 8. Apply Ez Flow Essential Oil Plus to the cuticles and massage into the skin.